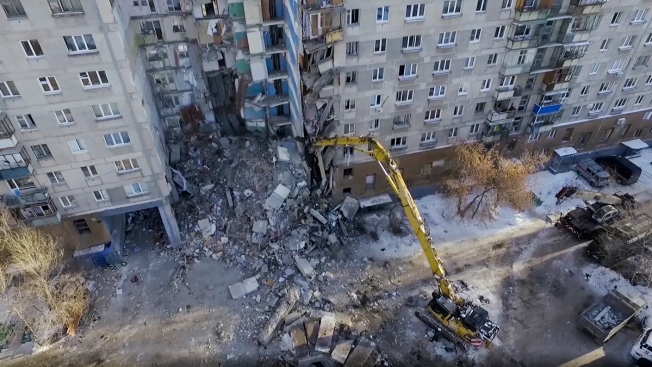 This photo provided by the Russian Emergency Situations Ministry taken from tv footage shows Emergency Situations employees work at the scene of a collapsed section of an apartment building, in Magnitigorsk, a city of 400,000 about 1,400 kilometers (870 miles) southeast of Moscow, Russia, Wednesday, Jan. 2, 2019. Search crews have pulled more bodies from a huge pile of rubble at a collapsed Russian apartment building. An 11-month-old baby was rescued from the rubble of a collapsed building in Russia Tuesday. The baby survived a day and a half in sub-freezing temperatures and is reportedly in stable condition. At least 28 people were killed when a gas line exploded underneath the building. The baby's parents also survived the collapse.